Among Paul Bowles' numerous travel writings is "Journey Through Morocco", first published in the February 1963 issue of Holiday magazine. (The original title was "The Route to Tassemsit".) Bowles begins his adventure by car in Tangier, driving through Chefchaouen (Chaouen), Marrakech, across the Middle, Grand and Anti-Atlas mountains, to Taroudant, Tiznit and Tafraoute. He finally arrives at a remote village where he is entertained by musicians and dancers, while recording Moroccan music for the Library of Congress. Whenever I leave Tangier to go south, my home takes on the look of a place struck by disaster. The night before I set out on this trip the usual disorder prevailed. There were crates of canned foodstuffs and bundles of blankets and pillows in the living room. The portable butane-gas stove and boxes of recording tape covered the road maps. I said good-by to my servants, who had induced me to write down the things they hoped I would buy for them while I was down there. Fatima wanted a white woolen blanket at least eight meters long, and Mina a silver-plated circular tray with three detachable legs. Following tradition, they had scrupulously insisted that these things were to be paid for out of their wages after I returned, and I had agreed, although each of us was aware that such deductions would never be made. Moroccan etiquette demands that when the master of the house goes on a journey he bring back souvenirs for everyone. The farther he goes and the longer he stays, the more substantial these gifts are expected to be. In this country departure is often a predawn activity. After the half hour of early-morning prayer calling is finished and the muezzins have extinguished the lights at the tops of the minarets, there is still about an hour of dark left. The choir of roosters trails on in the air above the rooftops of the city until daybreak. It is a good moment to leave, just as the sky is growing white in the east and objects are black and sharp against it. By the time the sun was up, we were far out in the country, rolling along at a speed determined only by the curves and the occasional livestock in the road. The empty highway, visible far ahead, measured off the miles of open, mountainous countryside, and along the way no billboards came between us and the land. During the past year I had traveled some 25,000 miles around Morocco, recording music for the Library of Congress. The tapes that interested me most were the ones I had recorded in Tafraout, a region in the western Anti-Atlas. Since I had managed to get only six selections there, I wanted to go back there now and try to find some more. By my inland itinerary there was a distance of 855 miles to be covered between Tangier and Tafraout, and the roads would be fairly good all the way. The direct route to Marrakech via Rabat traverses flat terrain and has a certain amount of traffic. The unfrequented interior route we used, which leads through the western foothills of the Rif Mountains and over the Middle Atlas, takes an extra day but is beautiful at every point. Beyond Xauen [Chaouen] we followed for a while the River Loukkos, here a clear swift stream at the bottom of a narrow valley. We stopped for lunch, my driver and I, spread a rug under an old olive tree and ate, listening to the water skipping over the stones beside us. The hills rose steeply on both sides of the river. Not a person or a dwelling in sight. We started out again. A half hour farther, we rounded a corner and came upon a man lying face down on the paved surface of the road, his djellaba covering his head. Immediately I thought: "He's dead." We stopped, got out, prodded him a bit, and he sat up, rubbing his eyes, mumbling, annoyed at being awakened. He explained that the smooth road was a better place to sleep than the stony ground beside it. When we objected that he might easily be killed, he replied with the fine peasant logic that no one had killed him yet. Nevertheless, he got up and walked a few yards off the highway, where he slumped down again all in one motion, wrapped the hood of his djellaba around his head, and went back into the comfortable world of sleep. The next day was hotter. We climbed along the slowly rising ramp of the Middle Atlas, the great range that lies between the Rif and the Grand Atlas, a gray, glistening landscape. The shiny leaves of the scrub live-oaks, and even the exposed bedrock beneath, reflected the hot light of the overhead sun. Farther along, on the southern slope of the mountains, we passed the mangled body of a large ape that had not got out of the road fast enough—an unusual sight here, since these animals generally stay far from the highways. All afternoon we had been speeding down the gradually descending valley between the Middle Atlas and the Grand Atlas. The sun went down ahead of us and the moon rose behind us. We drank coffee from the vacuum bottle and hoped we would get into Marrakech in time to find some food. The new Moroccan regime has brought early closing hours to a land where heretofore night was merely a continuation of day. After the lunar brightness of the empty wasteland, the oasis was dark. The highway went for miles between high mud walls and canebrakes; the black tracery of date palms rose above them, against the brilliant night sky. Suddenly the walls and the oasis came to an end, and ahead, standing in the rubble of the desert, was a big new cinema trimmed with tubes of colored neon, the tin and straw shacks of a squatters' colony clustering around it like the cottages of a village around the church. In Morocco the very poor live neither in the country nor in the city; they come as far as the outer walls of the town, build these these desparate-looking bidonvilles out of whatever materials they can find, and there they stay. Marrakech is a city of great distances, flat as a table. When the wind blows, the pink dust of the plain sweeps into the sky, obscuring the sun, and the whole city, painted with a wash made of the pink earth on which it rests, glows red in the cataclysmic light. At night, from a car window, it looks not unlike one of our Western cities: long miles of street lights stretching in straight lines across the plain. Only by day you see that most of these lights illumine nothing more than empty reaches of palm garden and desert. 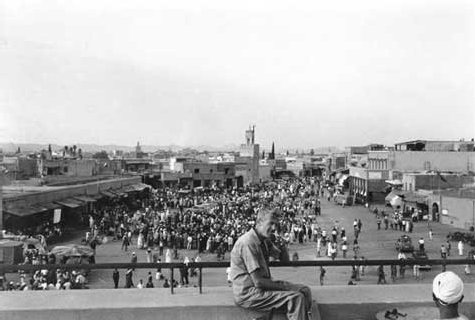 Paul Bowles overlooking the Medina of Marrakech, July 1961. Photograph by Allen Ginsberg is copyright © the Allen Ginsberg Trust and used with permission. Over the years, the outer fringes of the Medina have been made navigable to automobiles and horse-drawn buggies, of which there are still a great many, but it takes a brave man to drive his car into the maze of serpentine alleys full of porters, bicycles, carts, donkeys and pedestrians. Besides, the only way to see anything in the Medina is to walk. In order to be really present, you must have your feet in the dust, and be aware of the hot dusty smell of the mud walls beside your face. The night we arrived in Marrakech, we went to a café in the heart of the Medina. On the roof under the stars they spread matting, blankets and cushions for us, and we sat there drinking mint tea, savoring the cool air that begins to stir above the city after midnight when the stored heat of the sun is finally dissipated. Abruptly out of the silence of the street below, there came a succession of strange, explosive cries. I leaned over the edge and peered into the dim passageway three floors beneath. Among the few late strollers an impossible, phantomlike figure was dancing. It galloped, it stopped, it made great gravitation-defying leaps into the air as if the earth under its feet were helping. At each leap it yelled. No one paid any attention. As the figure came below the café, I was able to identify it as a powerfully built young man; he was almost naked. I watched him disappear into the dark. Almost immediately he returned, doing the same inspired dance, occasionally rushing savagely toward other pedestrians, but always stopping in time to avoid touching them. He passed back and forth through the alley in this way for a quarter of an hour or so before the qahaouaji, having made the tea, climbed the ladder again to the roof where we sat. When he came I said casually: "What's going on down there?" Although in most places it would have been clear enough that a madman was loose in the streets, in Morocco there are subtle distinctions to be made. Sometimes the person turns out to be merely holy, or indisposed. "Ah, poor man," said the gahaouaji. "He's a friend of mine. We were in school together. He got high marks and played good soccer." "What do you think? A woman, of course." This had not occurred to me. "You mean she worked magic on him?" "What else? At first he was like this—" He let his jaw drop and his mouth hang open; his eyes became fixed and vacant. "Then after a few weeks he tore off his clothes and began to run. And ever since, he runs like that. The woman was rich. her husband had died and she wanted Allal. But he's of a good family and they didn't like her. So she said in her head: No other woman is going to have him either. And she gave him what she gave him." "He doesn't know his family. He lives in the street." "And the woman? What happened to her?" "He shrugged. "She's not here any more. She moved somewhere else." At that moment the cries came up again. "But why do they let him run in the street? Can't they do anything for him?" "Oh, he never hurts anybody. He's just playful. He likes to scare people, that's all." I decided to put my question. "Is he crazy?" At twilight one day we were the tea guests of Moulay Brahim, one of the Moroccans who previously had helped me make contacts with native musicians. He lived in a rooming house near the dyers' quarters. The establishment, on the second floor, consisted of a dozen or more cubicles situated around an open central court with a dead fountain in the middle. No women were allowed in the building; it was a place for men who have left home and family behind. Not an object was visible that could even remind one of the existence of traditional Moroccan life. Moulay Brahim is militantly of his epoch; his life is almost wholly abstract. He spends his hours in an attitude of prostration on his mattress, his head touching a large short-wave radio. He knows what time it is in Jakarta, just where the Nigerian representative to the United Nations is at this moment, and what Sekou Touré of Guinea said to Nkrumah of Ghana about Nasser of Egypt. The radio is never silent save for a useless five minutes now and then while he waits impatiently for a program in Cairo or Damascus or Baghdad to begin. He follows the moves in the cold war like an onlooker at a chess match, making searing comments on what he considers the blunders of both sides. Only the neutralist powers have his sympathy. We sat in the dusk around the dimly illumined radio and listened to it hiss and crackle. Moulay Brahim passed pipes of kif silently, intent on the panel of the instrument, weighing each gradation of static with the expression of a connoisseur certain of his ground. Fifteen minutes might go by without a trace of any sort of program coming out—only the unvarying noise of interference. His face did not change; he knows how to wait. At any moment he may hear something identifiable. Then he can relax for a bit, while the tea-concession man from across the courtyard brings in the big tray, sets up the glasses and rolls the mint between his hands before stuffing it into the pot. But soon it is not enough for Moulay Brahim to know that he is in touch with the BBC service to the Middle East, and he begins once again the painful search for the unfindable. Inhabitants of the other rooms came in and squatted, but it was difficult to engage them in anything more than desultory conversation. They had learned from experience that in Moulay Brahim's room it was better to be quiet. At one point, when a particularly confused noise had for some time been issuing from the loudspeaker, I rashly suggested that he adjust the dial. "No, no!" he cried. "This is what I want. I've got five stations here now. Sometimes others come in. It's a place where they all like to get together and talk at once. Like in a café." For a young and deracinated Moroccan like Moulay Brahim, radio is primarily neither a form of entertainment nor a medium of information. It is a sort of metaphysical umbilical cord, a whole manner of existence, an essential adjunct to feeling that he is in contact with life. When we had finally persuaded him that it was time for us to leave, he reluctantly rose from the radio and took us out into the streets to the apothecary market, where I had expressed a desire to go. It is the place you visit if you want the ingredients for making black magic. There were six stalls in a row, all bristling with the dried parts of birds, reptiles and mammals. We wandered slowly, by examining the horns, quills, hair, eggs, bones, feathers, feet and bills that were strung on wires in the doorways. I was put in mind of the unfortunate Allal and the rich widow, and I described Allal to Moulay Brahim. He knew him; everybody in Marrakech knew him, he declared, adding as he pointed to the rows of glass containers in front of us: "You can get everything for that sort of business here. But you've got to know how to blend them. That takes an expert." He raised his eyebrows significantly and approached the nearest merchant to mutter a few words to him. A packet containing tiny seeds was brought out. Moulay Brahim examined them at some length, and bought fifty grams. "What is it?" I asked him." But he was enjoying his brief role as mystery man, and merely rattled the seeds in their paper, saying: "Something very special, very special." We left Marrakech at noon, driving straight up to Ouirgane, in a valley about three thousand feet above the plain. Brilliant day. Sky like a blue enamel bowl overhead. Lunch outside in the sun at Le Sanglier Qui Fume, our table midway between a chained eagle and a chained monkey, both of which watched us distrustfully while we ate. Below, hidden, somewhere nearby, the little river roared over its rocks. The Grand Atlas sun fiery, Monsieur gave us drooping old straw sombreros to wear during our meal. A tame stork, very proprietary, strutted around, poking its beak into everything. It was wary, however, of the monkey, which had a long bamboo pole in its hand and patiently tried to trip it up each time it came past. Everything excellent: hors d'ouvre, frogs' legs and chicken paprika. Madame is Hungarian, said she lives in the hope that people coming through Ouirgane will prove to speak her language, ". . . or at least know Budapest," she added. Obviously disappointed in us. On up to the pass at Tiz'n Test and over the top. The valley of the Souss thick with a mist that looked like smoke. Only the long sloping rim of the Anti-Atlas showed in the sky to the south, fifty miles across. Below, a gulf of vapor. Got into Taroudant at seven. The heat was still everywhere inside the walls. While I was unpacking, a procession of Guennaoua shuffled by in the street. (The Guennaoua are a Sudanese religious cult whose members practice medico-psychic therapy.) Tried to get out through a door in the patio, but it was padlocked. I peeked through a crack and saw them going past slowly, carrying candle lanterns. The pounding of the drums shook the air. After Taroudant—Tiznit, Tanout, Tirmi, Tiffermit. We cross great hot dust-colored valleys among the naked mountains, dotted with leafless argan trees as gray as puffs of smoke. Sometimes a dry stream twists among the boulders at the bottom of a valley, and there is a peppering of locust-ravaged date palms whose branches look like the ribs of a broken umbrella. Or hanging to the flank of a mountain a thousand feet below the road is a terraced village, visible only as an abstract design of flat roofs, some of the color of the earth of which they are built, and some bright yellow with the corn that is spread out to dry in the sun. The argan trees are everywhere, thousands of them, squat and thorny, anchored to the rocks that lie in their dubious shade. They flourish where nothing else can live, not even weeds or cacti. Their scaly bark looks like crocodile hide and feels like iron. Where the argan grows the goats have a good life. The trunk is short and the branches begin only a few feet from the ground. This suits the goats perfectly; they climb from branch to branch eating both the leaves and the greasy, bitter, olivelike fruit. Subsequently their excrement is collected, and the argan pits in it are pressed to make a thick cooking oil. Tafraout is rough country—the Bad Lands of South Dakota on a grand scale, with Death Valley in the background. The mountains are vast humps of solid granite, their sides strewn with gigantic boulders; at sunset the black line of their crests is deckle-edged in silhouette against the flaming sky. Seen from a height, the troughs between the humps are like long gray lakes, the only places in the landscape where there is at lest a covering of what might pass for loose earth. Above the level surface of this detritus in the valleys rise smooth expanses of solid rock. The locusts have fed well here too. Tafraout could never subsist on its dates. But the bourgeois Berbers who live here learned long ago that organized commerce could provide greater security than either the pastoral or the agricultural life. They created a virtual monopoly on grocery and hardware stores all over Morocco. Taking his male children with him, a man goes to a city in the north where he has a shop (or several shops) and remains there for two or three years at a stretch, living usually in conditions of extreme discomfort, sleeping on the floor behind the counter. Being industrious, thrifty and invariably successful, he is open to a good deal of adverse criticism from those of his compatriots who despise his frugal manner of living and deride his custom of leaving boys of eight in charge of his shops. But the children run the establishments quite as well as their elders: they know the price of every object and are equally difficult to deal with in the national pastime of persuading the seller to lower his asking price. The boys merely refuse to talk; often they do not even look at the customer. They quote the price, and if it is accepted, hand over the article and return the change. It is a very serious matter to be in charge of a store, and the boys behave accordingly. As you come up from Tiznit over the pass, the first Tafraout settlements on the trail occur at the neck of a narrow valley; built among, underneath and on top of the great fallen lumps of granite, the fortress-houses dominate the countryside. It is hard to reconcile the architectural sophistication of these pink and white castles with the unassuming aspect of their owners back in the north, just as it is difficult to believe that the splendid women, shrouded in black and carrying copper amphoras or calfskin-covered baskets on their shoulders, can be these inconspicuous little men's wives and sisters. But then, no one would expect a tribe of shopkeepers to have originated in the fastnesses of this savage landscape. We arrived at Tafraout about five in the afternoon, after having a puncture ten miles up the trail. Hotel completely empty, save for a handful of ragged children and one old gentleman in a djellaba who had been left in charge of the premises while the regular guardian was down in Tiznit. he helped with luggage, hung up our clothes, prepared the beds, brought pails of water for washing and bottles of drinking water, and filled the lamps with kerosene. Slept heavily and late. Woke once in night to hear a great chorus of howling and barking below in the village. Lunch better than dinner last night, but everything was drowned in an inch of hot oil. Tajine (stew) of beef, almonds, grapes, olives and onions. Came back up to the hotel to make coffee on the terrace afterward. The old man who received us last night was sitting in a corner, buried under his djellaba. He saw we were looking at magazines, got up and came over. Soon he said timidly: "Is that an American book you are reading?" I said it was. He pointed to a color photograph and asked: "And are the mountains in America really all green like that?" I told him many of them were. He stood a while studying the picture. Then he said bitterly: "It's not pretty here. The locusts eat the trees and all the rest of the plants. Here we're poor." A bearded Moroccan interne stood under a pepper tree in the hospital's patio, a syringe in his hand; he said the doctor had gone to Agadir for the weekend, but that if I wanted I could speak with the French pharmacist, who in the absence of his chief was in charge of the institution. The pharmacist, a Monsieur Rousselot, arrived rubbing his eyes. He had been working all night, he told us. There was no Rovamycine. "It's an expensive drug. They don't supply us with that sort of thing here." We invited him to the hotel for a whiskey. Alcoholic drinks are not on sale in Tafraout, since Moslems cannot drink legally. The only Europeans in the region were the doctor and the pharmacist, and they got by with an occasional bottle of wine or cognac they brought from Tiznit. The pharmacist brought with him a Moroccan medical student who had just arrived from Rabat the day before; he thought Tafraout the strangest place he had ever seen. We sat on the terrace in the scalding sun and watched the crows flying in a slowly revolving circle high above the valley. I was disappointed in my present visit, I told Monsieur Rousselot, because I hadn't got into the life of the people and because there was no edible food. The second reason touched the Frenchman in him. "I shall do my best to fill these unfortunate lacunae," he said. "First let us go to my house for lunch. I have a good chef." The house behind the hospital was comfortable. There were several servants. Walls were lined with books, particularly art books, for like many French men of medicine, Monsieur Rousselot loved painting, and had a hankering to try his hand at it himself one day. After lunch, as we sat over coffee and brandy, I complimented Monsieur Rousselot on the excellence of his food, told him how grateful we were for his kind invitation, and said I hoped we might see him again on a subsequent visit, since we would be leaving in the morning. Seddiq, the medical student, looked crestfallen. "Oh, no! You can't go!" cried Monsieur Rousselot. "I have something much better for you tomorrow." I said we had to start moving northward. "But this is something special. Something I discovered. I've never shown it to anyone before." "It's not possible," I said. He pleaded. "Tomorrow is Saturday. Leave on Monday morning. We can spend tomorrow night in the palace and have Sunday morning for exploring the oases." "Two days!" I cried. But the curiosity he had counted on awakening must have shown through my protestations. Before we left his house I had agreed to go to Tassemit. [Tassemsit is not the real name of the town. The author was taken there contingent upon the understanding that he would not use its true name.] I could scarcely have resisted, after his description of the place. According to him, Tassemsit was a feudal town at the bottom of a narrow canyon, which by virtue of being the seat of an influential religious brotherhood had so far escaped coming under the governmental jurisdiction, and was still functioning in a wholly traditional fashion. Absolute power was nominally in the hands of a nineteen-year-old girl, the present hereditary saint whose palace was inside the walls. In reality, however, said Monsieur Rousselot, lowering his voice to a whisper, it was the family chauffeur who held the power of life and death over the citizens of Tassemsit. The old Cherif, father of the girl-saint, for many years had run the zaouia where religious pilgrims came to pray and leave offerings. Not long ago he had bought a car to get up to Tafraout now and then, and had hired a young Marrakchi to drive it. The old Cherif's somewhat younger wife, as wives sometimes do, had found the chauffeur interesting, and "l'inévitable" had happened: the old Cherif had suddenly died and the wife had married the young Marrakchi, who had taken charge of everything: the woman, the holy daughter, the car, the palace and the administration of the shrine and the town around it. "It's an equivocal situation," said Monsieur Rousselot with relish. "You'll see." It is early morning the next day. Others still asleep. Big grilled window beside my head. A world of dappled sunlight and shadow on the other side of the wrought-iron filigree, an orchard of fig trees where small birds dart and chirp. Then the mud wall, and beyond, the stony floor of the canyon. A few pools of water in the riverbed. The women are out there, getting water, bringing it back in jugs. Background to all views: the orange side wall of the canyon, perpendicular and high enough to block out the sky from where I sit on the mattress. We heard more lurid details about the place from Rousselot, Saturday during lunch. When the chauffeur took over in Tassemsit he conceived the idea of providing girls to keep the pilgrims occupied at night, when the zaouia is closed. A great boost to the local economy. A holy city of sin, said Rousselot with enthusiasm. Merely speak to the chauffeur, and you get any woman in town, even if she happens to be married. He had hardly finished telling us all this when a little fat man came in. Rousselot's face was a study in chagrin, dropped jaw and all. He rallied then, introduced the little man around as Monsieur Omar, and made him sit down with us for coffee. He was some sort of government employee. When he heard that we were about to leave for Tassemsit, Monsieur Omar said very simply that he would go with us. It was clear enough that he wasn't wanted, but since nobody said anything to the contrary, he came along, sitting in back with Rousselot and Seddiq, the medical student. The trail was rough in spots on the way up over the peaks just south of Tafraout. Going down the other side it was narrower, but the surface was no worse. Had we met another car, one of us would have had to back up for a half hour. The landscape became constantly more dramatic. For two hours the trail followed a valley that cut deeper and deeper into the rock walls as it went downward. Sometimes we drove along the bed of the stream for a half mile or so. At the date-palm level we came across small oases, cool and green, that filled the canyon floor from cliff to cliff. The lower we went, the higher the mountain walls above, and the sunlight seemed to be coming from farther away. When I was a child I used to imagine Persephone going along a similar road each year on her way down to Hades. A little like having found a back way out of the world. No house, no car, no human being all afternoon. Later, after we'd been driving in shadow a good while, the canyon widened, and there on a promontory above a bend in the dry riverbed, was Tassemsit, compact, orange-gold like the naked rock of the countryside around it, still in the sunlight. A small rich oasis just below it to the south. The zaouia with its mosque and other buidings seemed to occupy a large part of the town's space. A big, tall minaret in northern style, well-preserved. We stopped and got out. Complete silence throughout the valley. Monsieur Rousselot had seemed pensive and nervous all during the afternoon. He got me aside on some pretext, and we walked down the trail a way, he talking urgently the whole time. It worried him very much that Monsieur Omar should be with us: he felt that his presence represented a very real danger to the status quo of the place. "One false move, and the story of Tassemsit can be finished forever," he said. "C'est très délicat. Above all, not a word about what I told you. Any of it." I said he could count on me. It came to me as we walked back up toward the car that there was probably another reason, besides the fact that he wanted to keep the place as his private playground, why Monsieur Rousselot was worried. A Frenchman's job in Morocco, if he works for the government, is never too secure in any case; it is easy to find a pretext which will dispose of him and replace him with a Moroccan. At Monsieur Rousselot's insistence we waited another half hour; then we drove down a side trail to the right, to within two hundred feet of the town gate. A mist of sweet-smelling woodsmoke hung over the canyon. Several tall black men in white cotton robes appeared at the top of the rocks above us, came down to the car, and recognized Monsieur Rousselot. Smiling, they led us through a short alley into the palace itself, small, primitive and elegant. The big room where they left us was a conscious synthesis of luxury and wild fantasy: with its irresponsible color juxtapositions it was like something Matisse would have produced had he been asked to design a Moorish salon. "This is our room," said Monsieur Rousselot. "Here we are going to eat and sleep, the five of us." While we were unpacking, our host came in and sat down in our midst for a while. He was pleasant-mannered, quick-witted; he spoke a little French. A man in his late twenties, born in the country, I should say, but used to living in the city. At one point I became aware of the conversation he was having with Monsieur Rousselot, who had taken a seat beside him on the mattress. It concerned the possibility of an ahouache, to be sung and danced by citizens of Tassemsit later in the evening. Afterward, when the host had left, Monsieur Rousselot announced that not only would we have the entertainment, but that a certain number of women would take part in it. "Very unusual," he commented, looking owlishly at Monsieur Omar. Monsieur Omar grinned. "We are fortunate," he said; he was from Casablanca and might as well have been visiting Bali for all he knew about local customs. "You understand, of course," Monsieur Rousellot went on to say to me with some embarrassment, this ahouache will have to be paid for." "Of course," I said. "If you can give me three thousand francs, I should be glad to contribute two." I protested that we should be delighted to pay the whole amount, but he wouldn't consider it. Through the windows, from the silence in the canyon outside, came the thin sound of the meuzzin's voice calling from the mosque, and as we listened, two light bulbs near the ceiling began to glow feebly. "It's not possible!" I cried. "Electricity here?" "Tiens," murmured Monsieur Rousselot. "He's got his generator going at last." A tall servant came in and announced that the Cherifa was expecting us on the floor above. We filed out under the arcade and up a long flight of stairs. There at the top, on an open terrace, surrounded by roaring pressure lamps, sat our host with two women. We were presented to the mother first. She would have been considered elegant anywhere in the world, with her handsome head, her regal white garments and her massive gold jewelry. The daughter, present titular ruler of Tassemsit, was something else; it was difficult to believe that the two had anything in common, or even that they inhabited the same town. The girl wore a pleated woolen skirt and a yellow sweater. She had had her front teeth capped with gold, and noisly snapped her chewing gum from time to time as she chatted with us. Presently our host rose and conducted us back down the stairs into our room, where servants had begun to arrive with trays and small tables. It was an old-fashioned Moroccan dinner, beginning with soap, towels and a big ewer of hot water. When everyone had washed and dried himself, an earthenware dish at least a foot and a half across was brought in and set in our midst. It held a mountain of couscous surrounded by a sea of sauce. We ate in the traditional manner, using our fingers, a process which demands a certain minimum of technique. The sauce was bubbling hot, and the tiny grains of semolina (since the cook knew his business) did not adhere to each other. Some of the food we extracted from the mound in front of us got to our mouths, but a good deal of it did not. I decided to temporize a bit until someone had uncovered some of the meat buried in the center of the mass, and when my opportunity came I seized a small piece of lamb which was still too hot to touch with comfort, but which I managed nevertheless to eat. "I see that even the rudiments of local etiquette remain unknown to you," remarked Monsieur Rousselot to me in a voice which carried overtones of triumph rather than the friendly concern it might have expressed. "Have I committed an infraction?" I asked. "Of the gravest," he said solemnly. "You ate a piece of meat. One is constrained to try some of every other element in the dish first, and even then one may not try the meat until one's host has offered one a piece of it with his own fingers." I said this was the first time I had eaten in a home of the region. Seddiq, the medical student, observed that in Rabat such behavior as Monsieur described would be considered absurd. But Monsieur Rousselot was determined to be an old Moroccan hand. "Quelle decadence!" he snorted. "The younger generation knows nothing." A few minutes later he upset a full glass of tea on the rug. "In Rabat we don't do that either," murmured Seddiq. Shortly after tea had been served for the third time, the electricity began to fail, and eventually it died. There was a pause in the talking. From where he sat, the head of the house shouted an order. Five white-dustered black men brought in candle lanterns; they were still placing them in strategic positions around the room when the lights came on again, brighter than before. The lanterns were quickly blown out. Candles are shameful. Twenty minutes later, in the midst of a lion story, (stories about lions are inevitable whenever city people gather in the country in South Morocco, although according to reliable sources the beasts have been extinct in the region for several generations), the current failed again, abruptly. In the silence of sudden darkness we heard a jackal yapping: the high sharp sound came from the direction of the riverbed. "Very near," I remarked, partly to seem unaware of the host's probably embarrassment at having us witness the failure of his power system. "Yes, isn't it?" He seemed to want to talk. "I have recorded them many times. Not one jackal—whole packs of them." "You recorded them? You have a tape recorder here?" "From Marrakech. It doesn't work very well. At least, not always." Monsieur Rousselot had been busy scrabbling around his portion of the rug; now he suddenly lit a match and put it to the candle of the lantern near him. Then he went the length of the big room, lighting the others. As the patterns painted on the high ceiling ecame visible again, there was the sound of hand drums approaching from the town. "The entertainers are coming," said our host. Monsieur Rousselot steped out into the courtyard. There was the increasing sound of voices; servants had appeared and were moving about beyond the doorway in the gloom. By the time we all went to look out, the courtyard had some fifty or sixty men in it, with more arriving. Someone ws building a fire over in a corner under the far arcade. A drum banged now and then as its owner tested the membrane. Again the electricity came on. The master of the palace smiled at Monsieur Rousselot, disappeared, and returned almost immediately with a servant who carried a tape recorder. It was a small model. He set it on a chair outside the doorway, and had difficulty connecting it because none of the wall plugs appeared to work. Eventually he found a live one. By that time more than a hundred men were massed under the arches around the open center of the courtyard, and in the middle were thirty or more musicians standing in a circle. The host had propped the microphone against the machine. "Why not hang it on the wall?" I suggested. "I want to talk into it once in a while," he said. When he turned the volume up, the machine howled, of course, and there was laughter from the spectators, who until then had been very quiet. The host had another chair brought, and he sat down in it, holding the microphone in his hand. More chairs were provided from out of the darkness, and someone arrived bringing a pressure lantern, which was set inside the musicians' circle. The traditional fire for heating the drums should have been inside the circle, but there was not enough space in the courtyard to put it there. The performers, all Negroes, wore loose white tunics, and each carried a poignard in a silver scabbard at his waist. Their drums were the regulation bendir, a skin stretched over a wooden hoop about a foot and a half in diameter. This simple instrument is capable of great sonorous variety, depending on the kind of blow and the exact spot on the membrane struck by the fingertips or palm. The men of South Morocco do not stand still when they play the drums; they dance, but the purpose of their choreography is to facilitate the production of rhythm. No matter how involved or frenzied the body movements of the players (who also sing in chorus and as soloists) the dancing is subordinate to the sound. It is very difficult to hear the music if one is watching the performance; I often keep my eyes shut during an entire number. The particular interest of the Anti-Atlas ahouache is that the drummers divide themselves into complementary groups, each of which provides only certain regularly recurring notes in the complex total of the rhythmical pattern. The men began to play; the tempo was exaggeratedly slow. As they increased it imperceptibly, the subtle syncopations became more apparent. A man brandishing a gannega, a smaller drum with a higher pitch and an almost metallic sonority, moved into the center of the circle and started an electrifying counter-rhythmic solo. His virtuoso drumbeats showered out over the continuing basic design like machine-gun fire. There was no singing in this prelude. The drummers, shuffling their feet, began to lope forward as they played, and the circle's counter-clockwise movement gathered momentum. The laughter and comments from our side of the courtyard ceased, and even the master of the palace, sitting there with his microphone in his hand, surrendered to the general hypnosis the drummers were striving to create. When the opening number was over, there was a noisy rearranging of chairs. These were straight-backed and completely uncomfortable, no matter how one sat in them, and it seemed clear that nobody ever used them save when Europeans were present. Few chairs are as comfortable as the Moroccan m'tarrba with its piles of cushions. Out in the open part of the courtyard groups of three or four men were crossing to the far corner to tune their drums over the fire. Soon they began again to perform; a long, querulous vocal solo was the prelude. One might have thought it was coming from somewhere outside the palace, from the silence of the town, it was so thin and distant in sound. This was the leader, creating his effect by standing in the darkness under the arches, with his face turned to the wall, as far away as he could get from the other performers. Between each strophe of his chant there was a long, profound silence. I became more aware of the night outside, and of the superb remoteness of the town between the invisible canyon walls, whose only connection with the world was the unlikely trail we'd rattled down a few hours earlier. There was nothing to listen for in the spaces between the plaintive cries, but everyone listened just the same. Finally, the chorus answered the far-away soloist, and a new rhythm got under way. This time the circle remained stationary, and the men danced into and out of the center in pairs and groups, facing one another. About halfway through the piece there was whispering and commotion in the darkness by the entrance door. It was the women arriving en masse. By the time the number was finished, sixty or seventy of them had crowded into the courtyard. During the intermission they squeezed through the ranks of standing men and seated themselves on the floor around the center, bundles without form or face, wrapped in great dark lengths of cloth. Still, one could hear their jewelry clinking. One of them on my left suddenly rearranged her outer covering, revealing a magnificent turquoise robe embroidered in gold; then swiftly she became a sack of laundry once more. Several set pieces by the men followed, during which the women kept up a constant whispering; it was evident that their minds were on the performance they were about to give. When the men had finished and had retired from the center, half the women present stood up and began to remove their outer garments. As they moved into the light they created a fine theatrical effect; the beauty of the scene, however, came solely from the variety of color in the splendid robes and the flash of heavy gold adornments. There were no girls at all among them, which is another way of saying that were were all very fat. A curious phenomenon among female musicians in Morocco: at the beginning of their performance they seldom give much evidence of rhythmic sense. This has to be worked up by the men playing the drums. At the outset they seem distraught, they talk and fidget, smooth their clothing, and seem interested in everything but the business at hand. It took a good deal of insistent drumming to capture the women on this occasion, but after two numbers the men had them completely. From then on the music grew consistently more inspired. "N'est-ce pas qu'elles sont magnifiques?" whispered Monsieur Rousselot. I agreed that they were wonderful; at the same time I found it difficult to reconcile what I was seeing with his earlier description of Tassemsit as a holy city of sin. Still, doubtless he knew best. As the shrill voices and the drumming grew in force and excitement, I became convinced that what was going on was indeed extraordinarily good, something I should have given a good deal to be able to record and listen to later at my leisure. Watching my host idly ruining what might have been a valuable tape was scarcely a pleasure. Throughout their performance the women never stirred from where they stood, limiting their movements to a slight swaying of the body and occasional fantastic outbursts of antiophonal handclapping that would have silenced the gypsies of Granada. With all that excess flesh, it was just as well they had no dance steps to execute. When the final cadence had died away, and while we were applauding, they filed back to the shadows of the arcade and modestly wrapped their great cloths around them, to sit and listen to the ahouache's purely percussive coda. This was vigorous and brief; then a great crash of drums announced the end of the entertainment. We all stood up quickly, in considerable discomfort for having sat so long in the impossible chairs, and went back into the big room. Five inviting beds had been made up along the mattresses at intervals of perhaps twenty feet. I chose one in a corner by a window and sat down, feeling that I should probably sleep very well. The courtyard emptied in no time, and the servants carried away the chairs, the lanterns and the tape recorder. Monsieur Rousselot stood in the middle of the room, yawning as he took off his shirt. The host was shaking hands with each of us in turn, and wishing us elaborate good-nights. When he came to me, he held out the flat box containing the tape he had just recorded. "A souvenir of Tassemsit," he said, and he bowed as he handed it to me. The final irony, I thought. Of course, the spoiled tape has to be given to me, so that I can know in detail just what I failed to get. But my words to him were even more florid than his to me; I told him that it had been an unforgettable occasion, and that I was eternally indebted to him for this undeserved favor, and I wished him a pleasant night. Monsieur Omar was lying in his bed smoking, clad only in his shorts, a delighted and indestructible Humpty Dumpty. He was blowing smoke rings toward the ceiling. I did not feel that the future of Tassemsit was in immediate danger. Our host went out, and the door into the courtyard was shut behind him. After everyone had gone to sleep, I lay there in the dark, listening to the jackals and considering my bad luck. Yet the original objective of the trip had been attained, a fact I discovered only when I got to the next place that had electricity. When I tried the tape at the hotel in Essaouira, fourteen of its eighteen pieces proved to be flawless. There was no point in wondering why, since logically the thing was impossible; it had to be accepted as a joyful mystery. It is always satisfying to succeed in a quest, even when success is due entirely to outside factors. We bought blankets, trays, rugs and teapots, and set out again for home. 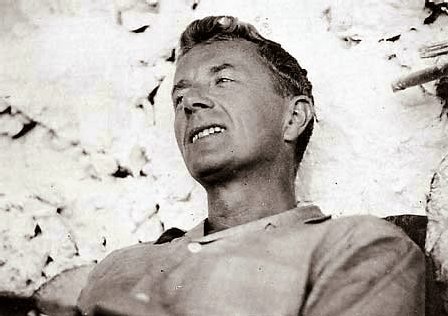 When visiting Tangier, a must place to see is the Paul Bowles Wing in the Tangier American Legation in the medina, where photographs, portraits, music scores, recordings, memorabilia, books and other items related to Paul Bowles and Tangier are on permanent exhibition. You may also purchase books by Paul Bowles in English, Spanish and French, or souvenirs. The museum, library and cultural center is open Monday to Friday, from 9 AM until 5 PM. (It is closed during lunch hours from 1 PM to 3 PM.) There is no charge for admission.